Ever since Priyanka Gandhi joined politics in January and was appointed as one of the two Congress general secretaries in charge of the party's campaign in Uttar Pradesh, she has championed women's issues and faced quite a few sexist comments. Priyanka Gandhi posted the image saying, "So proud to be flown by a lady today, that too in a chopper!". 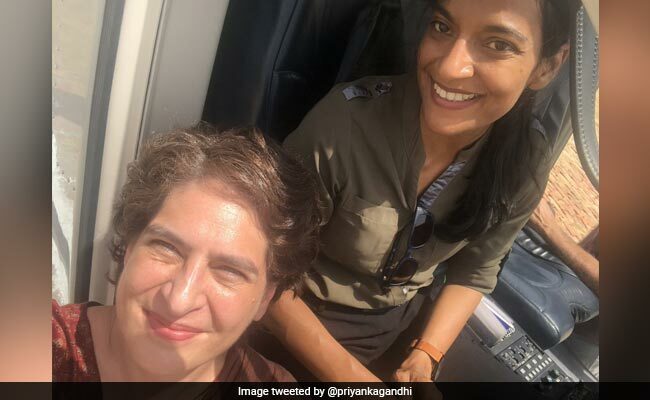 Congress leader Priyanka Gandhi Vadra, who was campaigning in Uttar Pradesh's Fatehpur Sikri on Monday, was visibly excited to be flown there by a female pilot. Ms Gandhi posted a picture on Twitter with the caption: "So proud to be flown by a lady today, that too in a chopper!" After the announcement of the party's income guarantee scheme Nyuntam Aay Yojana or NYAY scheme by Congress chief Rahul Gandhi, Priyanka Gandhi Vadra said what made her "most happy" about the party's minimum income guarantee proposal was the fact that it will provide women across five crore households with Rs 72,000 in their accounts every year.